During the hot summer of 2018 a film crew captured some wonderful footage for this programme being shown on French and German TV. 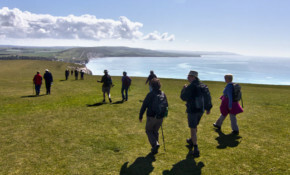 It's not just the wonderful scenery, but also the warm friendly welcome of the Island's accommodation providers, attractions, that keeps the Isle of Wight in the Trip Advisor Top Ten. The new chairman for Visit Isle of Wight says he's a "nose in, fingers out" person and is excited about working with the Visit IW team and BID levy payers. A great deal of love is shown for Isle of Wight produce by TV chef, James Martin, in the latest episode of his 'Great British Adventure’, shown on ITV earlier this week and available on catch-up. Details within. The Nightingale Hotel has been chosen by Lord Pickles to represent the Isle of Wight in the 2019 Parliamentary Review. Businesses are asked to share their knowledge and best practice in an attempt to raise standards across the country.